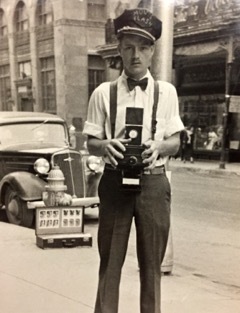 The photographers stationed themselves in high pedestrian traffic areas to capture images of shoppers and tourists, hoping to sell them souvenir portraits. Selle and his crew used Acme Street Cameras, adapted from DeVry movie cameras. Each camera was equipped with a harness to be worn on the photographer’s chest, and oriented sideways to expose vertical frames. The images are 35mm negatives on 100 ft rolls of film and there are over 900 rolls in the archive. Each 100 ft roll of film accommodated about 1000 frames. Selle only printed a small fraction of these negatives for those who sent in fifty cents for a souvenir postcard of themselves on Market Street or Union Square. Thus, many of these images have never been printed or viewed. The Joseph Selle Fox Movie Flash Archive was donated to VSW in 1975 by Joseph N. Selle.